In preparation for leading a history walk round Southwark sometime later this year, centred on my work on debtors’ prisons and sanctuaries, I have been assembling material on other aspects of the Borough’s radical history. As well as walking these places, I’ll be blogging them too, starting with an international incident in a brewery. Our own reporter, who visited Bankside on Thursday, ascertained that the general had a narrow escape from death, as his captors exhibited a strong inclination to extend towards him the same full measure of vengeance which he had so often exercised towards the unfortunate patriots of Hungary. In flying from his pursuers, he, as stated above, entered the George, where, after seeking vainly for some outlet by which to escape, he found his way into a small pantry, in which was a door. This door the general opened with the energy of desperation, and was half-way through it, when he found there was no hope of escape that way – the conqueror of Hungary had taken refuge in a dust-bin. As he stood looking around him, half in the pantry and half in the dust-bin, his pursuers overtook him; and, as he stood in a stooping posture, had a good opportunity of thrashing him with their various weapons, one of which, a bean-stalk, about an inch and a quarter in thickness, was used with such hearty good will, that it was broken upon his back. He was then seized by half-a-dozen of his assailants, some of whom had hold of his coat, while others less tender of his person, grasped his long moustachios, and dragged him back along the passage towards the street: but watching his opportunity, he managed, with the help of two labouring men, who were ignorant of his name, to break away from his captors, and rush up-stairs. His newly-found champions closing the door at the bottom of the staircase, and mounting guard outside. The general and his two foreign friends who had accompanied him, tried to escape by a window in one of the bed-chambers, but not succeeding, were compelled to remain in “durance vile,” until the arrival of a strong detachment of police enabled them to leave the house with safety. The general’s outer man had been so damaged in the fray, that he was glad to accept the loan of a coat, and that from a pitying bystander. The two men who had so gallantly defended the “Saviour of the Austrian Empire” against his assailants, were magnificently remunerated; the one receiving 4s. 6d , and the other 2s. 10d. for his services. The landlord of the George, upon inquiry at Morley’s Hotel, Trafalgar Square, on Thursday morning, was told that the general “had gone back.” Several dismissals have, we are told, taken place in Barclay’s brewery, but the obnoxious name of Haynau, together with those of his two companions, have been carefully obliterated from the visiting book. Transcribed from Reynold’s Newspaper, hosted at the British Newspaper Archive (subscription required). The attack quickly became an international incident between Britain and Austria, exciting a schism in government between the Prime Minister Palmerston and Queen Victoria, becoming a cause celebre in the newspapers, and initiating a bizarre debate on the morality of misogynistic violence as the defenders of Haynau accused the draymen of being wife-beaters and the press compared the flagelatory practices of Haynau with those of the Duke of Wellington. There was an explosion of ephemera about the incident. 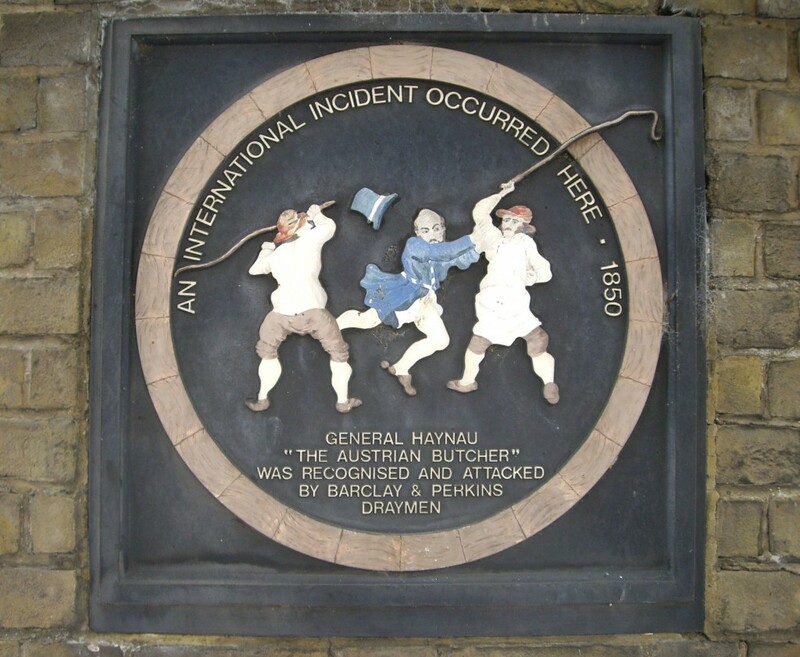 Innumerable prints and satires were published, and at least 4 songs written to commemorate this mobbing, three of which can be found online: General Haynau, Haynau’s Retreat, The Southwark brewers and the Austrian butcher. 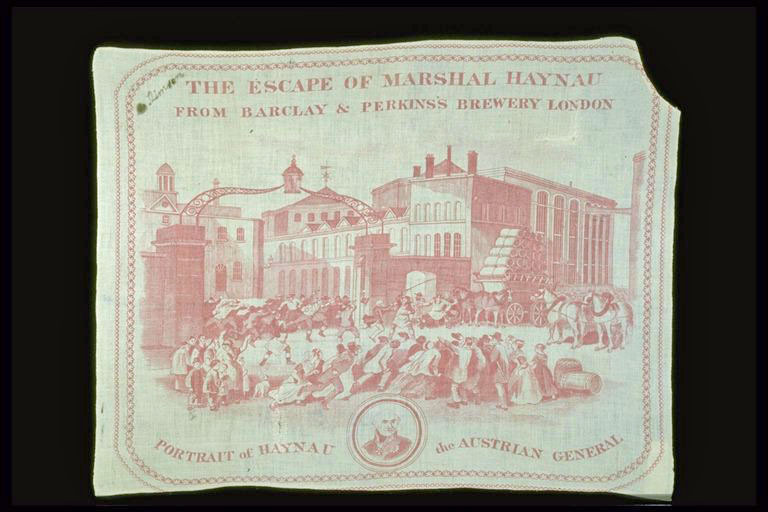 There was even a ‘Commemorative Handkerchief’, printed with a scene of the ‘Escape of Marshal Haynau from Barclay and Perkins Brewery, London.’ It is upon this that the illustration on the plaque is based. 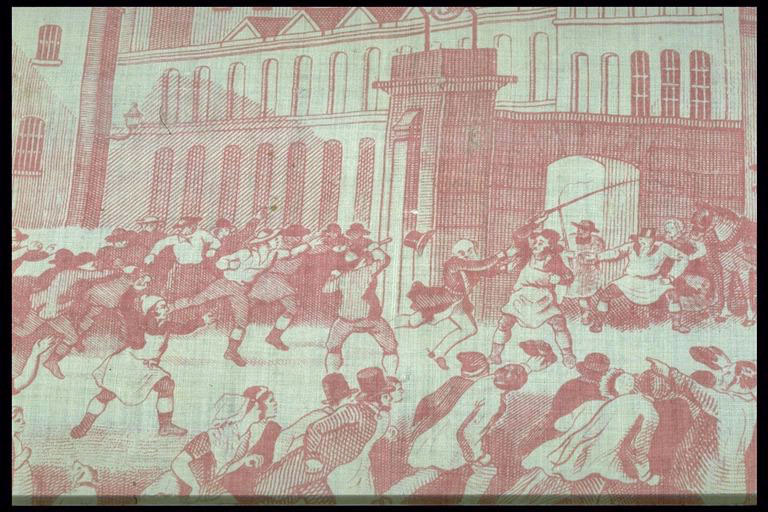 Hankerchief commemorating Haynau’s escape from Barclay & Perkins brewery, detail. The Zeitung fur Norddeutschland of the 11th inst., announces the arrival of General Haynau at Hanover, and the outbreak of some petty disturbances in consequence of a mob wishing to attack the hotel in which the marshal had taken his quarters. Several arrests took place, and it was found necessary to disperse the crowd by means of the civic guard. Hammerton, A.J., Cruelty and Companionship: Conflict in Nineteenth Century Married Life, on the sexual politics of the Haynau Riot. This entry was posted in history, london and tagged london, radical history, southwark. Bookmark the permalink.